You may know how to brew sencha. Did you know how to serve tea and wagashi (traditional Japanese sweets)? Unfortunately, many Japanese don’t care anymore, but there is an etiquette. 1) Tea should be on the right side of the guest. Sweets should be on the left. 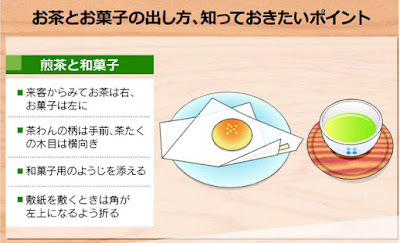 2) The pattern on the tea bowl, if any, are faced to a guest so that the guest can see it. Put the grain of wood of a saucer sideways. 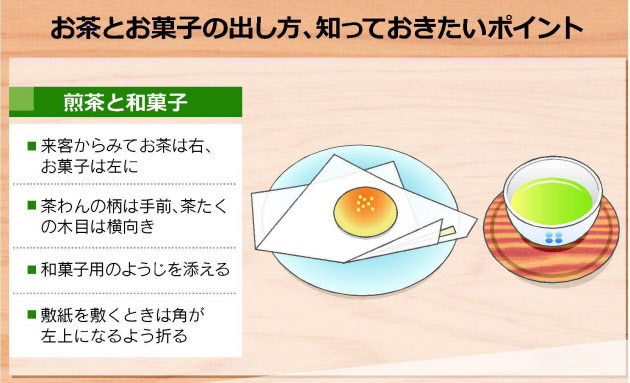 4) Fold the wagashi paper with the edges out of line like going down to the right. When you feel like the Japanese way, please try at least 1). It's easy to remember because "Tea is always Right"! \(^^)/. Anyway....we only three more days to go. I know many things are going on now, but I really hope the coming year will be peaceful, calm, and good one. 良いお年を！（Yoi o-toshi wo!) Wish you all the best for 2017. Which is First, Tea or Sweets?